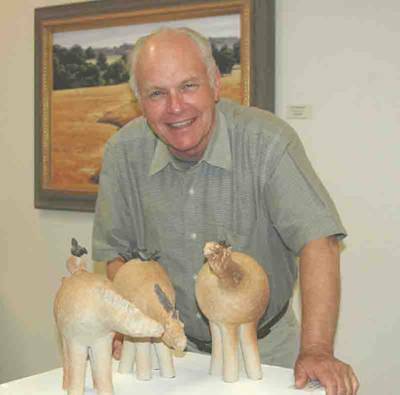 Larry Carnes combines considerable talent with humor and whimsy in his work with clay. He is a quiet master of the trade and was mentored by Otto Heino, a potter of world renown. Before he passed away, Otto’s work fetched prices in the 5-digits. During the half century of their friendship Otto passed along secrets of their trade. The famed ‘Momma of Dada’, Beatrice Woods sat under the tutelage of Larry in the early 1960s. A graduate of Chouinard Art Institute, he started in cartooning, but found his love in the world of clay. Larry has excelled in this field and has been under contract by all the major clay manufacturers as technical advisor for over four decades. He is a singular expert in his field. He became well-known in the Northern Foothills of California where he still has a large following, but now lives in Ojai. His studio/shop is one of the first to greet guests entering into the elite artist community of Ojai. Native American themes are found as a thread in much of his work. His tribal heritage and his love for the earth is manifested in his famous ‘Crow Ponies’ and more recently in the new series of Chumash Stones©. The Chumash Indians have given Larry permission to use the symbols of their ancestors in his work. These symbols are on the walls and ceilings of caves surrounding the Ojai area. 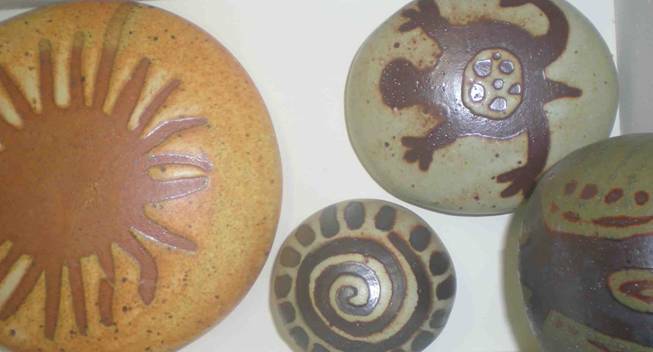 The Chumash Stones© were introduced in 2009 and a portion of all sales are returned to the tribe. Each one resembles a rock, however, they are each hand made, given a symbol and within each resides a clay bead. When moved, the stone produces a chime – a musical, earthly note. Larry has assembled them in artistic groupings within boxes, with figures representing the Chumash elders, and separately to touch and enjoy. They vary in size and color glaze. The Chumash series may retire in 2010 however, there is an inventory of items available at this moment. Each is impressed with the signature starburst of the artist.Larry continues to innovate and will be releasing a new series for 2010. He is a featured artist in the Annual Placer Arts Show in May 2010. Larry Carnes is a living, master potter; his work is avidly collected and will be remembered and enjoyed for generations to come. Thank you for your articulate writing, and thoughts. Look forward to reading your blog, and hugging you when I see you again.